My Latest FocusStacker is finally done. This setup is the best balanced version among all iterations of FocusStacker series I constructed earlier. I think, I finally found a good balance between the complexity and ease of use. Thanks to the new motor (2.8V and 1.3A per phase), A4988 step motor driver and bluetooth interface, FS4 draws only around 0.4A in idle mode and around 1A on load. This will be a good opportunity for field focus stacking. This was one of my biggest problems and I am glad it is finally solved. When the controls are on the stage itself, using the buttons and/or rotary encoder creates too much vibration. Moreover in some very high magnification levels, It ruins the framing. Making a cable connection between the controller and linear stage is a solution but that approach adds extra cables and makes it less compact. I used a bluetooth communication to control the linear stage with a regular Android phone. The best part is that you dont need to maintain the connection after the sequence started. You may move away along with your phone and it continues shooting. Once the connection is re-established, the remaining time is updated on the phone. Arduino’s usb plug can be reachable from outsideof the case. It can be re-programmed at any time. Communication between the Android app is established through simple serial commands, so new features and commands can easily be added. FocusStacker v4 is easier to build compared to the other versions. There are less components, less cable/soldering work. Since all the connectors and switches are on the PCB, it can run without installing on the case. The most difficult part is to find the linear stage. I couldnt find another one and had to salvage it from FocusStacker v2. It is that hard… If you want it to be installed on another Linear Stage, I can do the adaptation of components (or maybe the installation too) for you assuming that you cover my expenses. 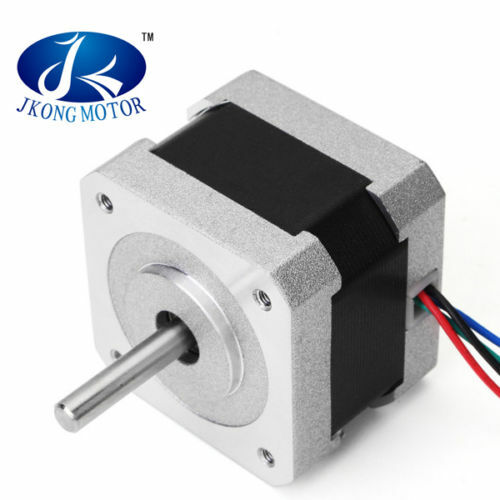 This part is a compact design of motor, driver, all electronic components and linear stage itself. On the right side of the base there is the power connector. 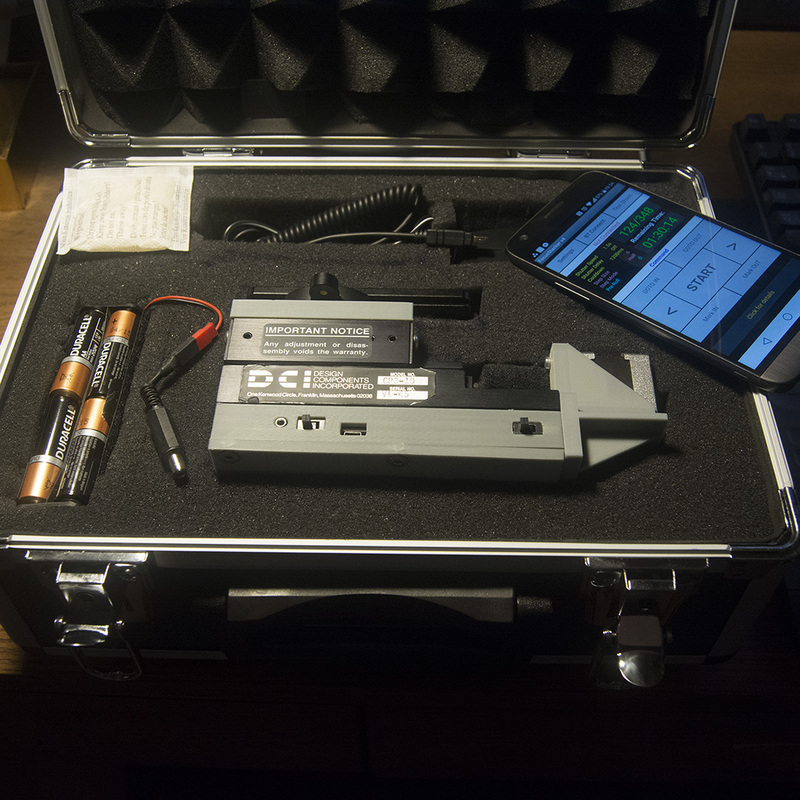 An 11v-17v battery or DC adapter with at least 2000mah can be connected here. On the left side, there are two switches and one 2.5mm connector to the camera. The switch near to the camera trigger connector is to change between Nikon and Canon camera trigger modes. As I mentioned in my previous posts, when triggering Nikon shutters, both tip and ring should be grounded, whereas in Canon cameras only tip is required to pulled down in order to send the trigger signal. The other switch, near to the motor is the power switch. Note that there are no light indicators to tell the device is on or off. A simple indicator could be added but I wanted to make it both simpler and less power consuming. The remote control is any Anroid Phone (or tablet) capable of bluetooth connectivity. I use DCI CP3-10 as the Linear Stage. This is the one I bought from Ebay a couple of years ago. This stage is very smooth compared to the deltron I owned. Since both of them acquired as second hand, It is hard to compare them objectively since I have no idea about their initial conditions. But again, even in the 8X magnifications and even the motor is misaligned to the main shaft (This is a measurement mistake I fixed at the final iteration of the project file) the movement is very smooth. Check the unstacked and unaltered video. I used an Arduino Nano again. Note that, I had to cut the ICSP pins because they were blocking the lid. One disadvantage of using nano is I had to disable Dragonframe connection because of the memory limitations of Arduino Nano. On the other hand, considering I “never” used that option in previous builds, it is not a big issue. Arduino Sketch will be here soon!!! As the step motor driver I chose a4988. You will need an extra capacitor but even with that it blocks less space then easydriver. It has the same dimensions with DRV8825. If a higher current motor used, it can be replaced with that. Do not forget to adjust the current limit according to your step motor specs. Or else you may damage your motor. Check the manufacturer web page and youtube video to learn about how to limit the current. I changed the baudrate of my Bluetooth module to 57600. 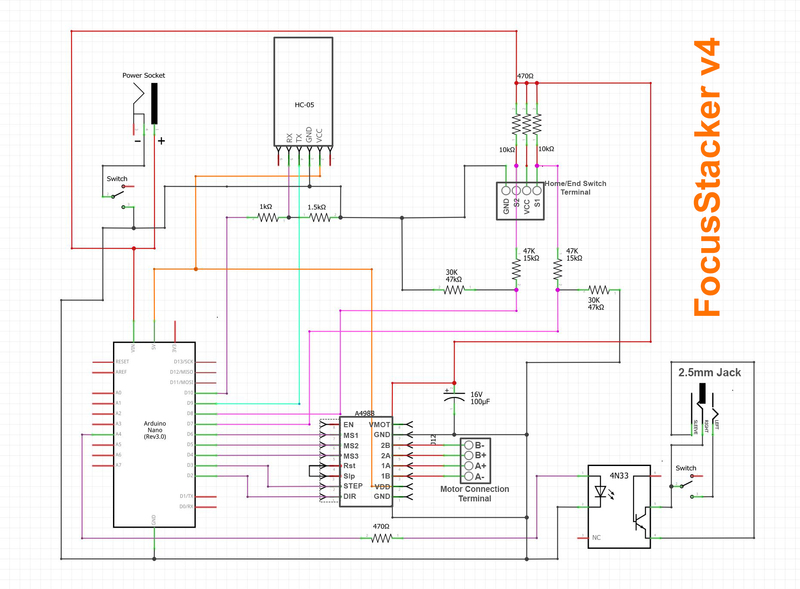 Provided Arduino sketch assumes that baudrate. Either edit the Arduino sketch or change the Bluetooth module’s baudrate with at commands. Check the second link below to use at commands. I used a Zortrax m200 printer do print out the stl files. These are designed to fit only my Linear stage. If you want to adapt the design with a different stage, you will need to edit these designs. Considering that I couldn’t find another DCI CP3-10, it is very unlikely these designs can be used again, but may be a starting point for someone. I wish I could have a CNC machined connectors and casing. But if it is not for 1000 pieces, it costs too much for my budget. I am ready to share deeper knowledge and work with people who can help me with the CNC machined parts. A sleek aluminium design would be very nice and cool. Other then that, If anyone owns or finds another DCI CP3-10 I would like to know that. Links to the 3d printable STL files will be here soon!!! I found a local electronics place to make the PCB. I ordered the most basic built. Single sided, no masking, no fancy stuff. Only the copper ways. Which actually makes it vulnerable to moisture and other weather conditions. It is ok for me since I wont be using it in extreme conditions, but in the future I will probably upgrade this. Link to the Fritzing Project File and PDF exports will be here!!! There are also some other required elements like various resistors, switches, connectors and terminals which can be either on eBay or your local electronics store. 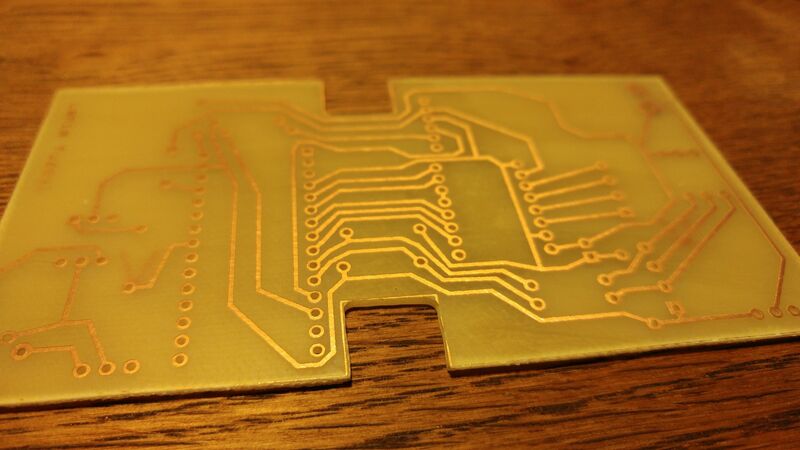 Although these components are very common and can be easily found, you need to make sure it will fit to your PCB. Because of that, before cooking the PCB, I highly suggest to get a real-size print out of it and check if the components are fitting or not. Especially the two-way switches have lots of variations, and yours may not fit on the pcb or may need extra holes. Another tip for inexperienced electronics enthusiasts: electricity flows from resistors through each way. You can put them in both ways. However, capacitors for example have + and – poles. You need to put 4N33 optocoupler with correct direction or you will probably fry it. 4n33 has a mark on one of its legs, that is the Anode(1) connector. Unsoldered pcb. It is very simple, single layered and no masking. Link to the Shopping List will be here!!! I used MIT’s App Inventor for the Android application, App Inventor is an easy to learn – block based coding platform. Since this is my first Android application, my code has some flaws and I had to use ridiculous workarounds. I think App Inventor is a perfect place to start but has its own limitations. 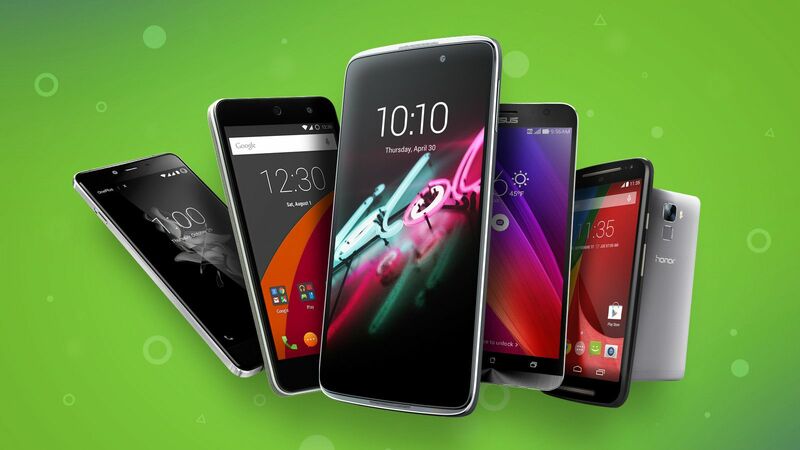 I am planning to rewrite it with Android Studio, which is the official professional platform for Android Apps. Link to the App Inventor Project File and .apk package will be here soon!!! Assembly procedure will of course change for each different linear stage. That is why I will skip the details like which bolts and nuts I have used, which filament I preferred for 3d printing etc. 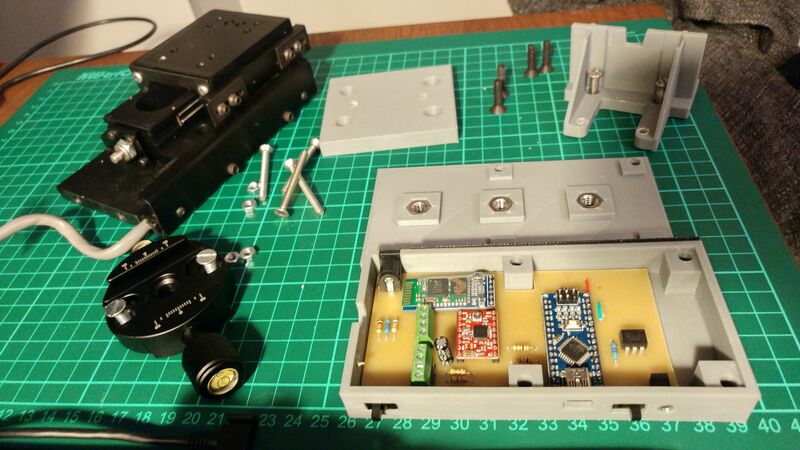 After assembling all the parts, power up the motor unit either with 12v 2A power supply, 8AA battery pack or 11.4 3s LI-po power pack. Please note that you may get bluetooth connection or even trigger the camera but cannot move the motor with USB connection. Open the application and from the BT Connect dropdown list select the HC-05 Bluetooth Module. I renamed my module to “FocusStacker” using the AT commands, check the links at “Bluetooth module” sections for details. Hit the “settings” button. Settings section divided into 3 sections. Yellow section is related with the timings. Pink section is related with the motor values. Cyan section is for uncategorized features. Select the same shutter speed value with the current shutter speed of your camera. Adjust the remaining settings as required. Hit the “Home” button on top left to get back to the main menu. Using the “<” and “>” buttons find the position that you want to start your stack. Hit “Mark IN” button. Mark IN button will turn blue indicating that the in point is marked. Find the position which will be the end of your stack and hit “Mark OUT” button. Check the info screen. You will see the total shots and remaining time with green numbers. Time is calculated by using the Delay values and Step Size entered in the settings sections. If you think the increments are too much or insufficient, change the step size. For most situations 100-150 shots is enough. If the calculation gives you 200 shots it is likely that you are overshooting. I suggest you to find the spot which is the most angled to the camera. Zoom in to that spot and check the in focus area move as you going forward and back. If the focused area jumps and leaves unfocused parts between each step, you need to decrease the step size. Hit “Test Shoot” to test that your camera connection is ok. “Test Shoot” is also very useful while making the lighting in studio shots, since even tiny touches on the camera itself creates huge shakes. When everything is ok, Hit start and grab a cup of coffee or lunch depending on your how long your stack will take. You can move away with your phone. You can even turn off your phone or close the app. The focus stack procedure will continue. When you get back in the bluetooth range or turn the app on, the app will update itself and you can always cancel the procedure from the app. So far this design is very usefull. Instead of adding new features, or changing the operation style, my next goal will be about making it more solid. Although 3d printing is an easy way of designing parts, I want to move on to cnc machined parts for the next version. Congratulations; really a very good job! Thank you very much for putting all the necessary data at the disposal of the community. Excellent project and excellent explanations in each of the four versions. I repeat my sincere thanks. Best regards from Spain. Thank you Javi for your warm comments. Best. Congratulations this is huge in time and work !!! Are you done this project ? can I see the all the thing somewhere else ? or in private ? © 2019 Arda Kutlu. All rights reserved.